"For three decades we've been helping people to protect their digital worlds. From a small, dynamic company we've grown into a global brand with over 110 million users in 202 countries and territories. Many things have changed, but our core aspirations, philosophy and values remain the same – to help build a more secure digital world where everyone can truly Enjoy Safer Technology." 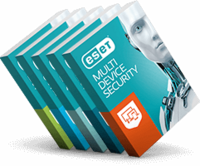 ESET began life as a pioneer of antivirus protection, creating award-winning threat detection software. Now, ESET's goal is to make sure that everybody can enjoy the breathtaking opportunities that technology offers. Today, our security solutions allow businesses and consumers in more than 200 countries and territories to make the most of the digital world. We will enable our users to enjoy the full potential of themselves and their technology in a secure digital world. Working with ethical and passionate people, we are building a safer technology environment for everyone to enjoy. We are doing this through education and our commitment to research and development. We believe in technology – and we want to make sure that you can enjoy it in safety. Learn more at enjoysafertechnology.com. We don’t take the easy way. We constantly push boundaries and are determined to make a difference. We encourage honesty and fairness in everything we do. We have an ethical approach to business. People need to know they can count on us. We work hard to live up to our promises, and to build trust and rapport. We’re passionate, driven and determined to make difference. We believe in ourselves and what we do. ESET makes the only product to ever pass the magical threshold of 100 VB100 Awards by Virus Bulletin. The first virus discovered by ESET's founders Peter Paško and Miroslav Trnka in 1987 was dubbed "Vienna". The company was named after the ancient Egyptian goddess and magical healer Eset. ESET takes pride in its rich history and numerous achievements. Launch of dedicated WeLiveSecurity website, covering a vast spectrum of security-related topics. ESET, spol. s r.o. is established; its first AV products go on sale in Czechoslovakia and abroad.